Looking for self-catering accommodation in Blythburgh and area? Blythburgh village stands within an Area of Outstanding Natural Beauty just inland from Southwold on the Heritage Coast of north-east Suffolk. The tidal section of the River Blyth flows just to the north of the village on its way out to the sea at Southwold Harbour. Over the years the sea-walls have been breached and the land not reclaimed, creating a tidal lagoon, Blythburgh Water, which is visited by many mud-loving birds. The village is bisected by the A12 road which is carried by an important road bridge over the River Blyth. Roads radiate in all directions from Blythburgh and the immediate area. This means Blythburgh is an excellent location, well placed to access the inland and coastal delights of this part of Suffolk. For those who prefer to walk there are local footpaths, notably including those to Walberswick on the coast or inland along the River Blyth to Wenhaston and Halesworth. Blythburgh is steeped in history. Residents are very proud of their village and retain a great sense of community, using both their Village Hall and Holy Trinity Church as social and event venues. In particular many classical concerts take place within Holy Trinity Church. For these and other local events go to our Blythweb Calendar. Holy Trinity Church is a masterpiece of church building, acclaimed as one of Suffolk's finest mediaeval churches. Read here about the marks within the church of the stonemasons whose skills are evident today. 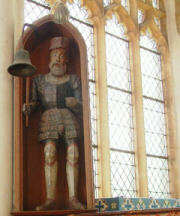 Inside, in addition to the wonderful 'angel roof' there is much to wonder at, including a rare Jack-o-the-clock painted wooden figure (pictured). Standing on high ground overlooking the fields and marshland of the Blyth Valley Holy Trinity Church is a memorable landmark. This is especially so at night when floodlights create a magnificent image. Close to the church is 'The Angel of the East', the Blythburgh village sign. Read more here about how this came about. 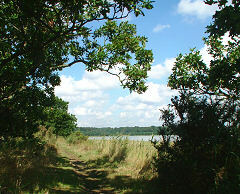 Click here for more information about Blythburgh.